Intellinet System is also serving agricultural industry at quite a large scale. With advancement in the technology, modern tools/machines are used in agricultural sector. Agriculture equipment manufacturing companies earn heavy profits by selling modern farm equipment, tractors etc. but face issue in selling spare parts which hinder their aftermarket sales. Aftermarket sales and parts order management pose a significant challenge to OEMs in the market. In order to overcome this issue, Intellinet offer Agriculture Parts Equipment Catalog Software. Intellinet's Farm Equipment Parts Catalogue Software and Tractors Spare Parts Catalogue Software help OEMs to boost their aftermarket sales. Leading companies like Mahindra Rise is one of our clients for Tractors Spare Parts Catalogue Software and you can be the next to leverage your business with our Agriculture Parts Equipment Catalog Software. Heavy machinery compromises of hundreds of small equipment and every unit is unique. Maintaining a manual record of the heavy machinery spare parts. offered by the company is a tedious task. In such case Intelli spare parts catalogue software serves as a one-stop solution for the spare parts of all the machinery offered by the company. Modification in the design and structure of the machines is quite common but this introduces new equipment in the market. Adding this new product to the manual catalog requires reprinting and entire distribution process. 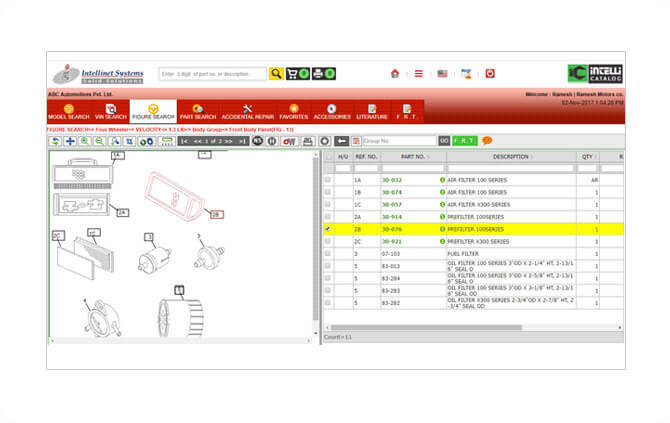 However, spare parts catalogue software allows you to update your catalogue in just few clicks. With Intellinet's Spare Parts Catalogue Software placing the order is just the matter of few clicks. Dealers just have to enter the part number or have to select the equipment and can easily order the spare part in just few clicks following the generic order process. This software also helps the OEMs to know the demand of their dealers as it provides a data showcasing the dealer's requirement. Thus, companies can maintain their inventory in accordance with the demand of dealers and meet their requirement easily. With extensive experience of 10+ years in Electronic Parts Catalogue, Order Management Solutions, e-commerce Solutions, Intellinet Agriculture Parts Equipment Catalog Software brings great value to OEMs.